Our Apps have an easy to use interface and an intuitive design that now offers the ease of connectivity through your mobile phone, Apple iPhone or any other mobile-enabled device. With the Hertz Apps, you can make reservations with ease, save your favourite locations, search for nearby Hertz locations and enjoy special offers. 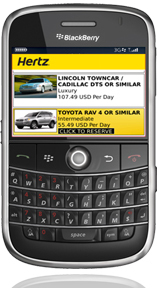 If you access www.hertz.com through a mobile device, you will be forwarded to the mobile version of the website. 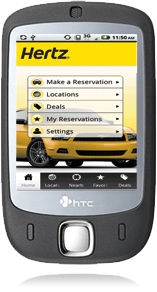 Hertz App is available for Apple iPhone, Android, Symbian (Nokia) and BlackBerry.